Abstract: The paper introduced the application of MV inverter on fan and pump in the thermal power plant. After the success inverter application of SA fans, we see enormous potential benefit. In 2002, we chose ID fan of #3 to reform. By comparing and studying, we consider vector inverter as the first choice as its high performance, reasonable price, widely using and good after-sale service. The vector inverter is Multi-level voltage source inverter with the technology of cascade-connected power cells. The rectifier is 30-pulses, diode three-phase full bridge, IGBT inverter bridge series output. In order to fully ensure the system reliability, a bypass device is configured with MV inverter. 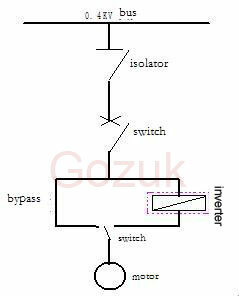 When inverter is broken, motor can be manually switched to direct on line. 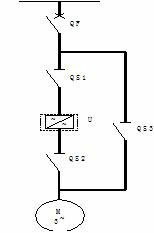 The bypass circuit is composed of 3 MV disconnecting switches QS1, QS2 and QS3. When the motor is driven by inverter, QS1, QS2 are closed and QS3 is open; when the motor is in direct on line, QS3 is closed, QS1,QS2 are open. The inverter is remote controlled through the start/stop buttons, switches for speed adjusting on the operation board of boiler, and it is able to communicate with DCS. To make operation convenience, there are many functions, such as alarm instruction, fault instruction, ready state, bypass, running, MV allowable, emergency stop, speed set, actual speed etc. Period of commissioning, installation and tests was 4 days. We also made some dynamic tests such as fully-loaded, system threshold vibration test, bus voltage-hunting test, interlock test between MV switch and inverter and continuous 72 hours preoperation. According to the data, the current of the fan reduces from 25A to 15A, which means around 130 kW/h is saved. The energy-saving ratio is more than 50% and the benefit is obvious. Due to perfect economic benefit, we would reform other devices. On the one hand, 3# pump force is too small to meet the demand of the consumption. Other 2 pumps force is too large to control, and this leads to motor frequent stop/start. On the other hand, the ideal method for purifying is water-supply continuously which is high efficiency and good effect. If the pump frequently stops/starts, it may lead to water break. When water conditioner stops, the plastic pipe is easy to be aged for exposing in the sunshine long term. If the water conditioner stops too long , it should be rewashed so that water is wasted considerably. Furthermore, it is 600 meters long between the pump room and the water conditioner, and the pipe is laid too shallow to be easy burst in winter. All above are caused by long time water-stop, sleeper in pipe, water freezing in low temperature. Thus we plan to reform for 1#, 2# pump with inverter. 4.1 The boilers' security is basic guarantee for the plant. Although the inverter is reliable, once it faults, system must make sure boiler work well. Thus, bypass circuit is required. Generally, if manual bypass meets demand, it is better not to choose automatic bypass cabinet. 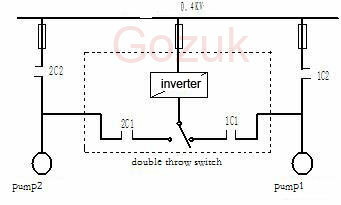 For normal low-power motors, manually/automatic bypass by double throw switches is ideal. 4.2 For large inertia-load motors (boilers' ID fans), there might be flexural resonance. Once it happens during operation, fans and motor might be damaged seriously. Thus the critical speed must be calculated and some measure must be done, such as set frequency leap point, soft connection, add rubber. 4.3 After reform with inverter, if inverter works below 25Hz long time, with speed reducing, motor heat reduces. Thus, temperature of motor declines and it works normally without overheating. 4.4 The inverter can not transfer power back to grid, thus it requires that QS2 and QS3 can not switch off at the same time for ID fan. 4.5 Low-voltage inverter which is smaller, easy to choose the installation site in technology reform. But for medium-voltage inverter which is much larger, generally composed of 4-5 cabinets, needs a room. Thus the site can not be too far from the motor. It requires a better circumstances for inverter stable and reliable operation. Temperature must be between 0 and 40℃. Air conditioning should be equipped if temperature is too high. At the same time, room inside must be clean, without dust, corrosive and explosive gas. 4.6 Make sure reliable earth. To avoid signal interfere, user should make independent earth system. Earth resistor is less than 4. signal wire to inverter must be screen cable. One terminal should be well earthed. 4.7 Considering practical operation situation, user can choose lower power inverter. For example, we use 132kW inverter to control 160kW motor in reform of SA fan. With the development of power electronics, the inverters performance is improving. In thermal power plant, there are a large number of pumps and fans, and inverter is widely used in technology reform for energy saving.